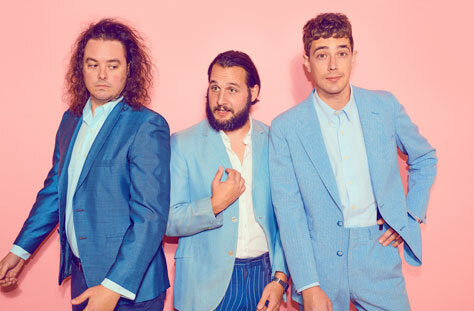 We’re delighted to be welcoming Born Ruffians back – plus guests The Kenneths! Ten years ago, on the very first song on their very first album, Born Ruffians revealed their ambitions to start their own country. They didn’t really offer details about how they would go about legally annexing land, drafting a constitution or establishing a native currency, but we did know this much: it had a population of three – singer/guitarist Luke Lalonde, bassist Mitch DeRosier and drummer Steve Hamelin. It would have a simple flag made up of the colours waved in the album’s title, Red, Yellow & Blue. And as that album vividly illustrated, their country was a primitive place marked by jagged terrain, rickety footbridges and sudden tremors. Its roughly sketched borders were defended by makeshift fences made of tangled guitar strings, broken drumsticks and – when all else failed – ravenous hoots ‘n’ hollers. Now, they return with their strongest record since that acclaimed debut. Uncle, Duke & The Chief was produced by Richard Swift – who knows a thing or two about balancing classicism and anarchy after working with the likes of The Shins, Foxygen and Nathaniel Rateliff – Uncle, Duke & The Chief is a record less concerned with what sounds hip than what feels good. In the Ruffians’ case that meant shedding some of their more arty influences and reconnecting with the sounds they first heard on their parents’ turntables as kids: Buddy Holly, The Everly Brothers and pre-psychedelic Beatles. ‘It’s about going back to the deepest, most satisfying itch to scratch,’ says Lalonde. And in doing so, the album takes you back to a time when the Ruffians sounded less like a band and more like a gang, raising a wild ruckus and speaking in telepathic tongues. Tour support comes from The Kenneths. London-based punk-rock trio The Kenneths released their fourth EP, titled Ex in April. Recorded live with producer Ben Baptie (The Strokes, Jamie T), Ex follows 2017’s Double N EP, which was produced by Descendents/Black Flag legend Bill Stevenson. The first single from Ex, Favourite Ex has already garnered national playlist on Radio X, as well as being Radio X and KERRANG! Radio’s Single of the Week, and BBC6 Music recommends and BBC Radio 1 Rock Show.